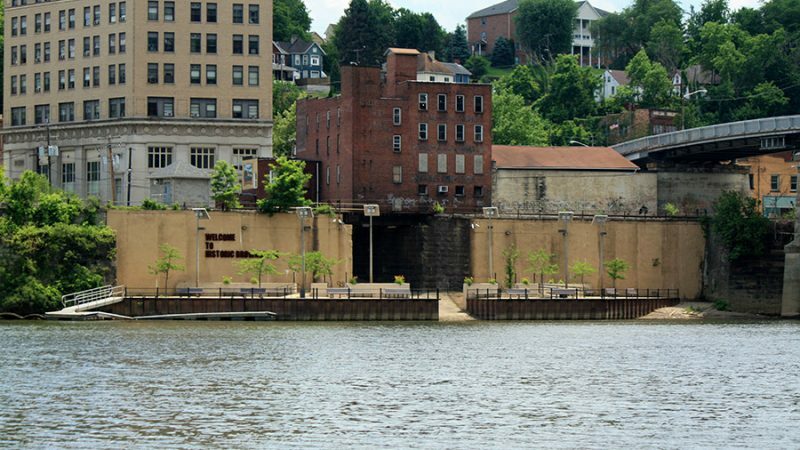 Brownsville was a frequent point of embarkation for travelers who were heading west via the National Road on land or via the Monongahela and Ohio Rivers. 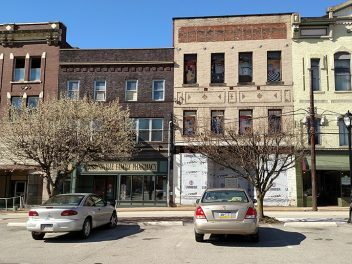 Brownsville’s position at the western end of the National Road in Pennsylvania contributed to its early prosperity, along with its easy access to the Monongahela River where a vast flatboat and later steamboat building industry developed during the 19th century. 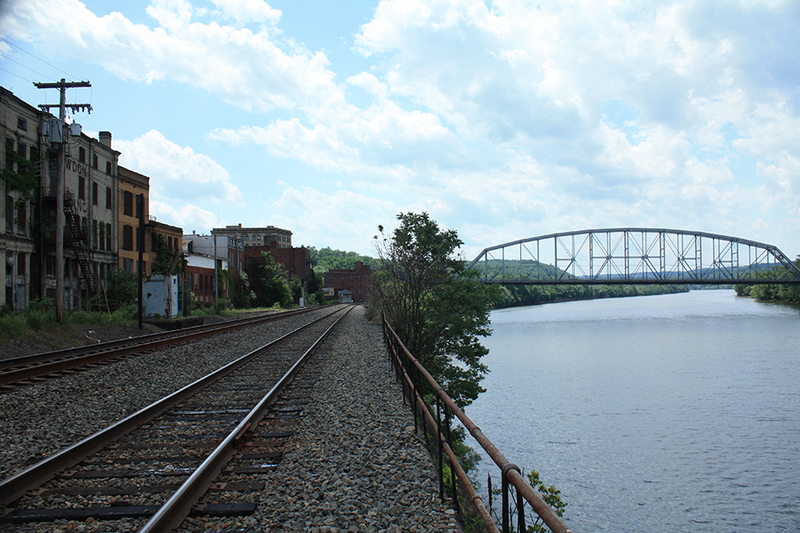 The access to the river provided a “jumping off’ point for settlers headed into the western frontier. 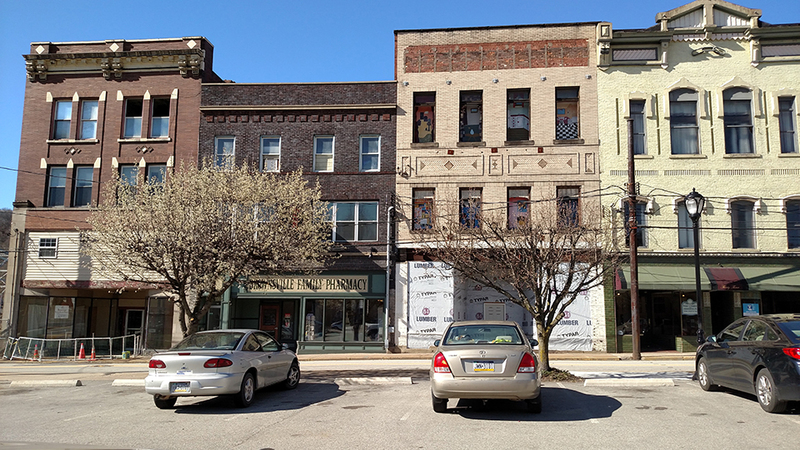 Up until 1830, Brownsville was wealthier and had a larger population than its neighboring Pittsburgh. 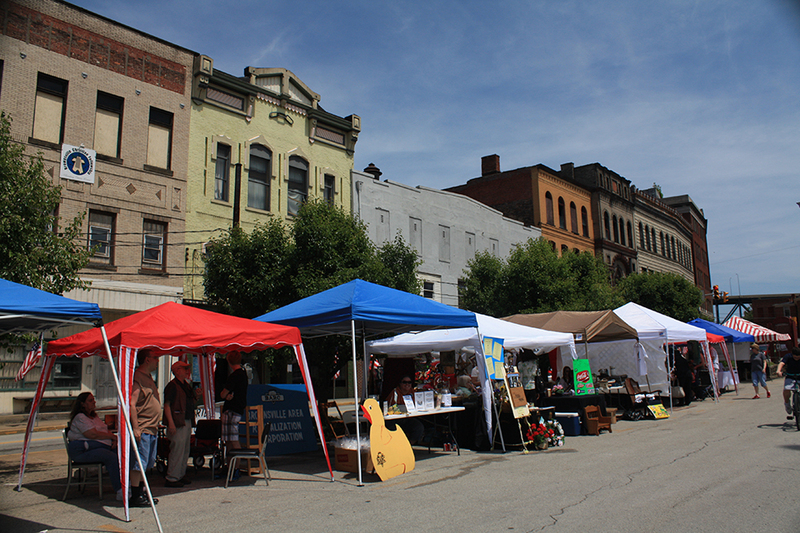 Brownsville has two historic districts, both of which are bisected by the National Road. Brownsville has six individually listed sites on the National Register of Historic Places. 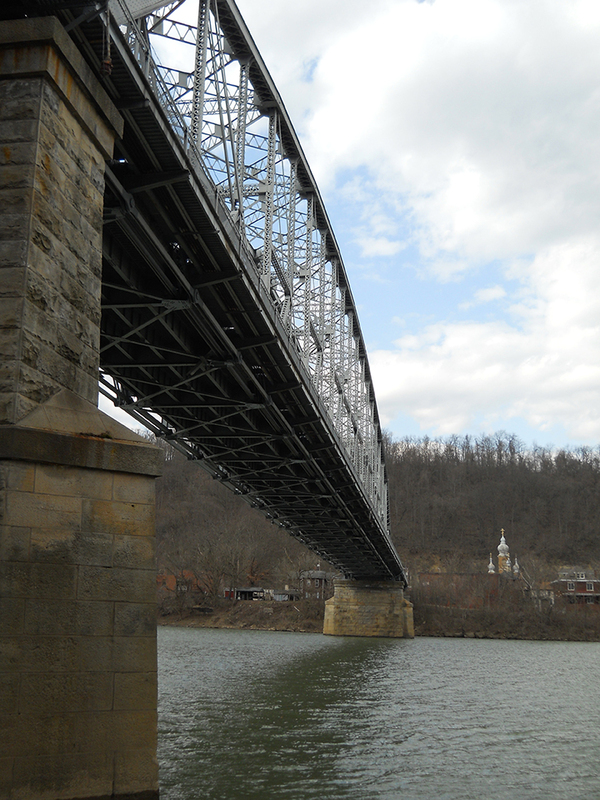 Built in the first half of the 19th century, the National Road opened up the land west of the Alleghenies and allowed a budding nation to expand its boundaries westward. 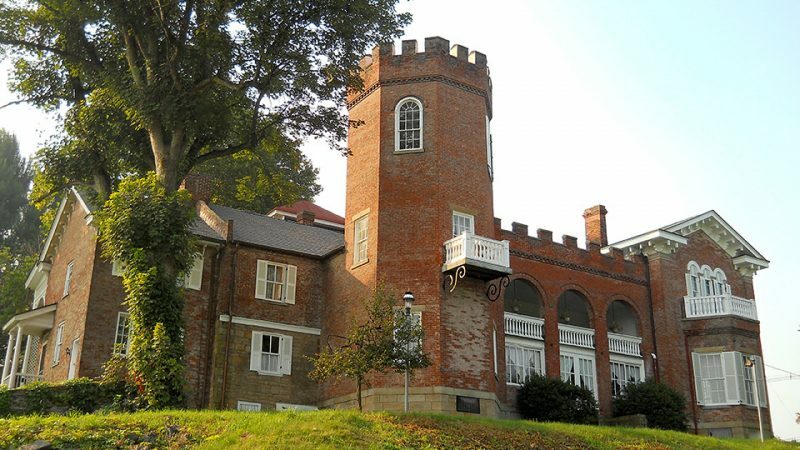 Today, the 90-miles of this important road in Pennsylvania celebrates the rich history, culture and scenic beauty of one of America’s oldest byways, America’s “Road to Revolution.” Brownsville’s attractions for tourists includes four museums: The Nemacolin Castle a 22 room house museum; the Flatiron building Heritage Center; The Frank L. Melega Art Museum ; The Transportation Museum as well as the first Cast Iron Bridge in America; the Riverside Wharf to fish and enjoy boating; a long time diner known for its hot dogs; the Twelve Oaks Restaurant; The Iron Bridge Amphitheater; Historic churches and tours of the town available upon request. Visit Brownsville’s gems on our websites and facebook. 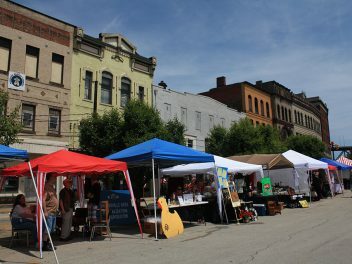 Brownsville has an array of restaurants to choose from while you are here. There are also several retail stores and other services available. Click on the button to the right to view the business directory. Dunlap’s Creek Bridge, located on Market Street, is heralded as the first cast iron, metal arch bridge built in the United States. It was dedicated July 4, 1839 and is still in use today. 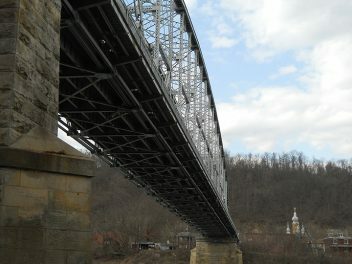 The bridge is listed on the National Register of Historic Places and is a National Historic Civil Engineering Landmark. The bridge also received the ASM award that is also bestowed on the Eiffel Tower and the Statue of Liberty. 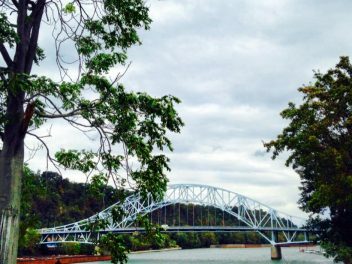 The bridge is slated for renovation to begin in 2018. Nemacolin Castle stands at the old site of Fort Burd from the French and Indian War. 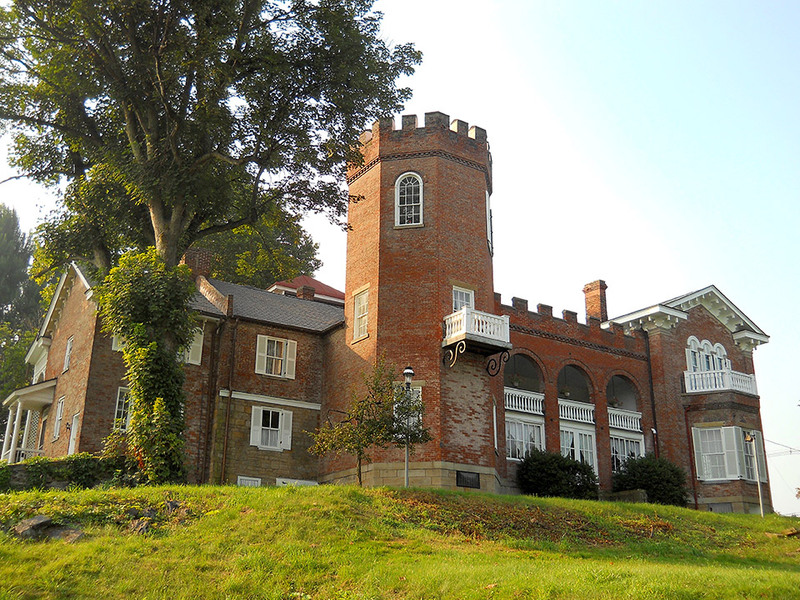 Construction began on the castle in 1789, and the crenellated tower was erected in the mid- 1800s. 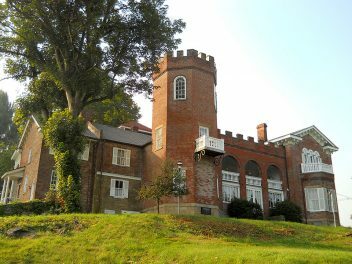 The castle is listed on the National Register of Historic Places and is open to the public for tours and events. 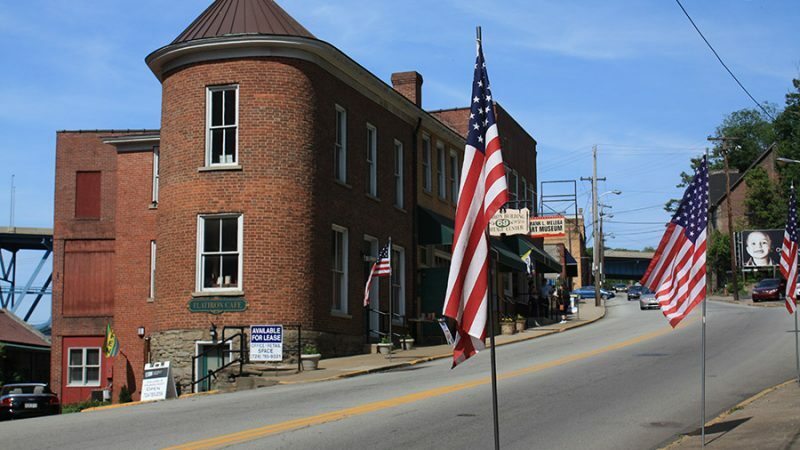 The Flatiron Building was built circa 1830 directly on the National Road as a commercial structure. 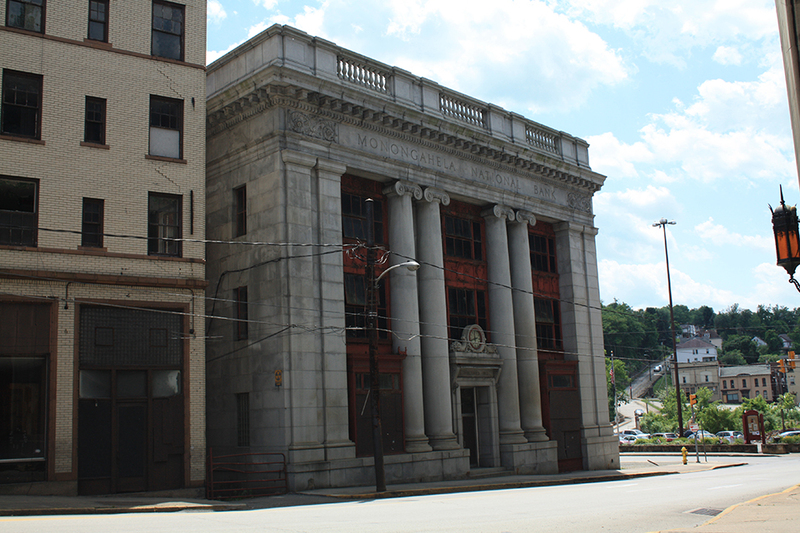 In addition to the age of the building being historical, the shape takes the form of an old-fashioned clothing iron. 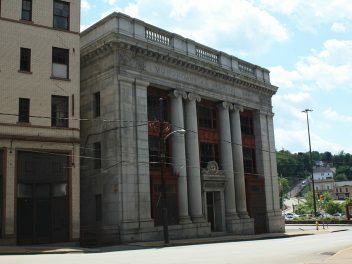 The building is the oldest structure on lower Market Street (the original National Road). 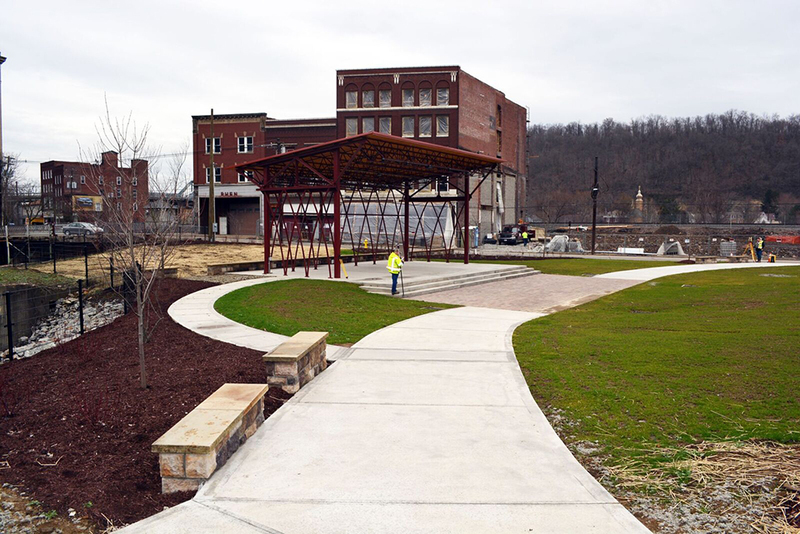 It is now the site of both the Heritage Center and the Frank L. Melega Art Museum. 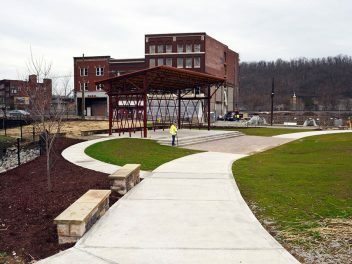 The Heritage Center was created to tell the stories of road, river, and rail as they relate to the community and the region. The Frank L. Melega Art Museum collects, preserves, interprets, and exhibits the artworks of Frank Melega. 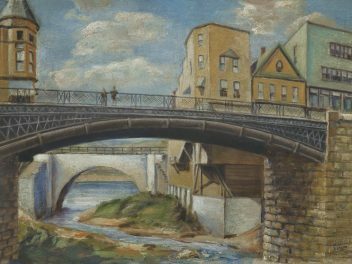 A changing exhibition of contemporary artists promotes their talent and offers the public, through variety in style, medium, and subject matter, an open ended definition of art. 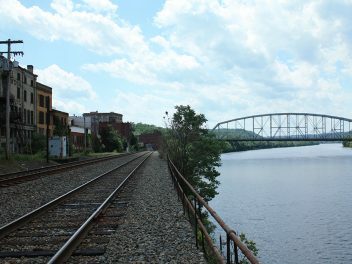 The Monongahela River, Rail, and Transportation Museum, on the northside of Brownsville, displays an impressive collection of artifacts and archival materials related to the history of river and rail transportation in this region. Hours are limited, so be sure to call first so that you don’t miss this attraction during your visit! Built in 1906, the Thompson House is a beautiful Spanish Colonial Revival style home listed on the National Register of Historic Places. 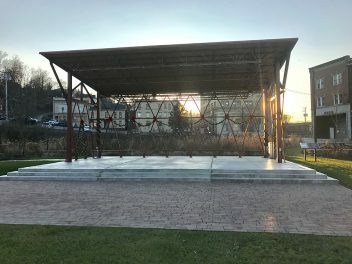 It also received the 1994 Outstanding Achievement Award for restoration at the sixteenth annual state conference for historical preservation, which is sponsored by the Pennsylvania Historical and Museum Commission. 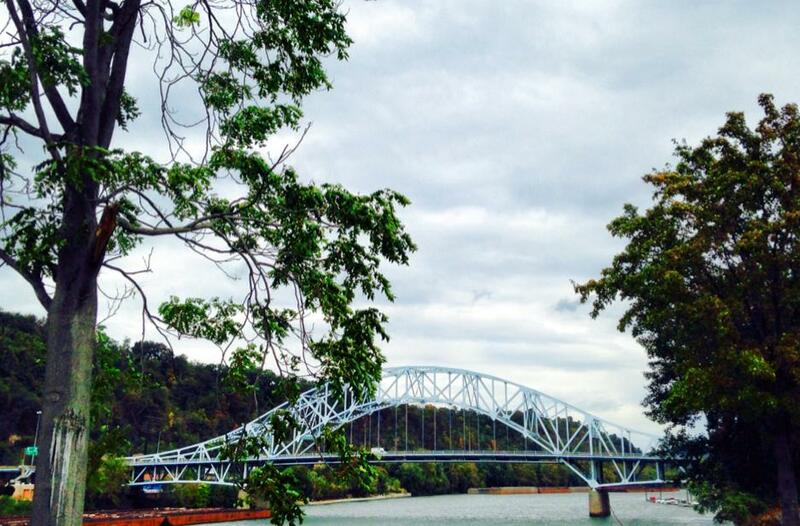 This section of the Monongahela River was named the River of the Year in 2013. A map and guide were created in 2013. Click here to download the map. Click here to download the guide. The Brownsville Riverside Wharf Park, located off of Water Street, is a public park that has a boat ramp in order to easily access the Monongahela River. The boat ramp is steep; be sure to inspect the site before you drive to the put-in, especially if you have a large boat. Canoes and kayaks will have no problem putting in. 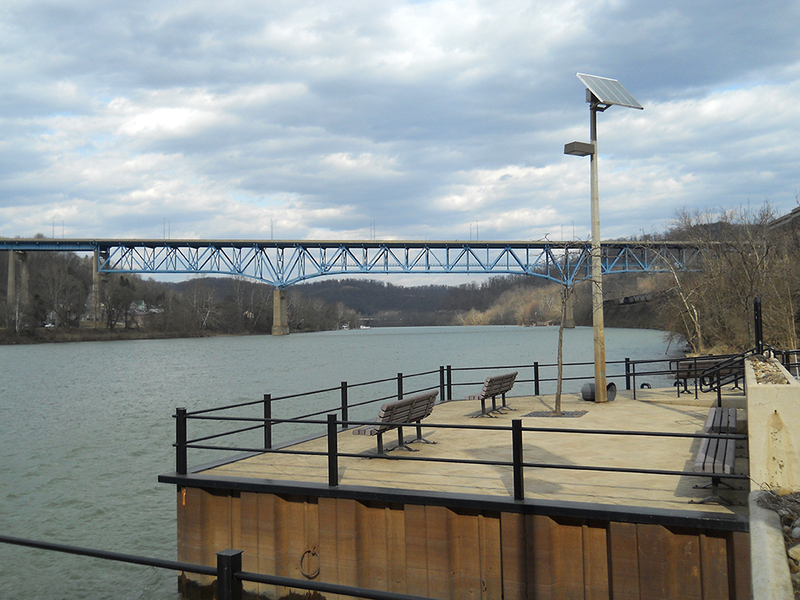 It is just a 4.5 mile trip downstream to the next boat ramp in California, PA. This makes a wonderful short day trip for fishermen, paddlers, and boaters alike. Smallmouth and largemouth bass, northern pike, muskellunge, channel catfish, sauger, walleye, saugeye, and yellow perch can all be found swimming in the waters surrounding Brownsville. Redstone Creek is a stream navigable by canoe that empties a mile north of Brownsville and is known locally to be great for fishing. 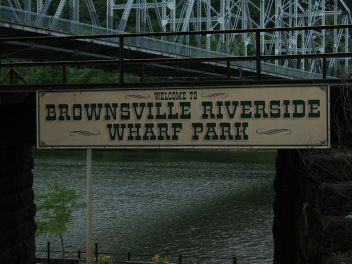 It is also possible to fish from the wharf at Brownsville Riverside Wharf Park if you are looking for a more relaxed setting. 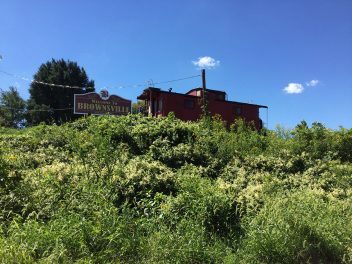 Interested in visiting Brownsville? 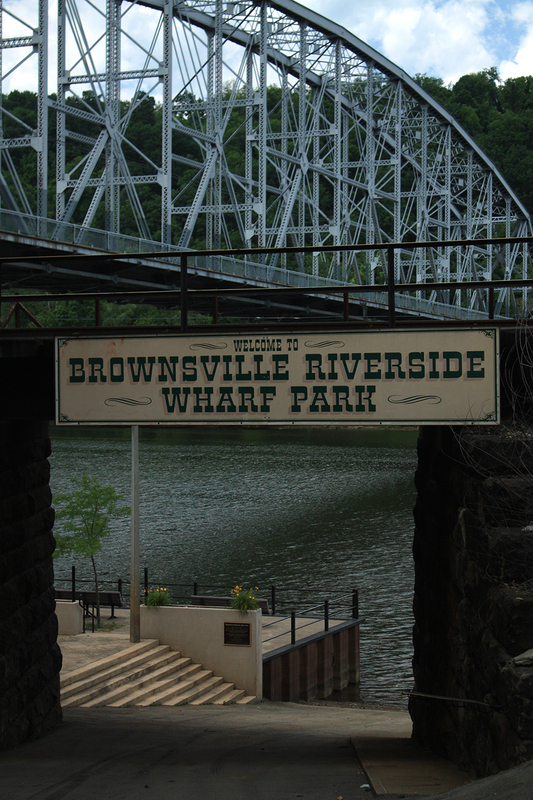 Read our sample itinerary, A Day in Brownsville, for ideas of where to go and what to do!